Sweet Tomatoes is a great salad bar and more restaurant. Everything is made fresh daily. This version of clam chowder features a nice Rosemary flavor, its unexpected, but really enhances the soup. You can make Sweet Tomatoes Clam Chowder with this copycat recipe. Cook potatoes until they are done but firm. Drain water off and set aside. Place 1 1/2 Cups milk and half and half into a saucepan on medium temperature and heat just until it starts to boil. Immediately remove from stove and set aside. Scalding milk will help prevent it from curdling. When the potatoes have cooked cut into large Julianne slices. In large pan fry bacon on medium high temperature to render grease from bacon and when done carefully take bacon from pan and leave grease. Place onions in bacon drippings and saute until clear. Add scalded milk, cooked potatoes, clams with juice, and seasonings. Bring to a slow simmer and stir occasionally, cook for 25 - 30 minutes. 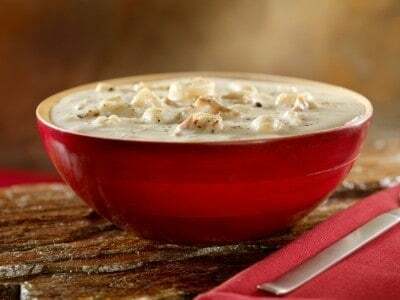 Chowder may be thicken now by adding flour to 1/2 cup of milk mixing well and slowly adding to chowder and stirring constantly until thick as desired and creamy. I am looking for the Turkey Herb and Dressing soup from Sweet Tomatoes also! That is the best soup ever! Only served in Dec….. I found their recipe for that soup listed in their blog on the sweet tomatoe/souplantation website. Made it several times. Did cut the recipe in half but it still makes ALOT. Freezes pretty well though. good luck. am looking for sweet tomatoes restaurant turkey herb soup recipe only served in Dec.